Having read Curt’s reply to your question regarding recursion vs. List.Generate() loops — even more relevant for my dynamically loaded functions due to loading overhead within every iteration — I decided to try and see if I could rewrite all functions I had in order to avoid recursion. That turned out more of a challenge for this function. I plugged most of the original code into List.Generate()’s ‘next’ block, at which point Power Query started complaining each of the var names used in the block would now need to be initialized in its ‘start’ block as well (not to mention adding square brackets everywhere). I eventually figured out a workaround by embedding a let-expression into the next block, allowing the flexibility of declaring regular variables without requiring the initialization and square brackets of the iteration Record. Resulting code here. I hadn’t left the original comments intact, nor tested for performance gains, but it feels like I learned a lot. I also added a parameter to optionally leave out the appended parent column names whenever possible. Pingback: VoluntaryTracking.Enabled = true; | Faister, say what? Thanks for your knowledge sharing. I have been having some trouble with the nested function. it seems that PowerQuery does not recognize it when I am trying to input it. I get an error : “Expression error : ExpandAll is not recognized ,Check your spelling (I’m translating the error from Hebrew so i hope i got it right…. ).do you know this kind of error ? The error is implying it doesn’t currently have a query named ExpandAll. If you’ve imported the query, did you make sure to name it that? it seems odd. when creating the function with the same syntax and name, the error appears. only when i remove the line that inner call the same function (“OutputTable = if NextColumnNumber>(Table.ColumnCount(ExpandedTable)-1) then ExpandedTable else ExpandAll(ExpandedTable, NextColumnNumber)”) it seems ok.
when I am using the same function in the sample xls file everything seems OK. Okay, I think I get it now… could you try adding a ‘@’ to the recursive call, like this: @ExpandAll? Any guidance on how to apply this approach to a SQL query result that includes an XML column? I could flatten it out using XML functionality in SQL, but thought it would be simple to apply this approach in Power Query. The challenge is that the XML column is retrieved as a text column, and is not treated as an expandable table. Forget it. I Just found the “Parse” option on the Transform tab. How did I miss that? JSON too! This works well, thanks Chris! It’s a bit of a performance killer though – it’s adding about 2 minutes to a 3 second query. I’m surprised there’s not an “expand all” option in PQ. Hi Chris, Thanks it works very nice. Now I’ve got a next question. I Work in a big Univerity Hospital and we get a lot of binary XML files as well as JSON files from Oracle and PostgreSQL databases. Because the JSON files have the record-Type and the XML Files have the table-Type the ExpandAll function doesn’t work with the record-Type. I’m searching for a Funktion for several days now but cannot find anything and am not familiar enough with M-Code. Do you have a Sugestion? Sorry no – it will be possible, I’m sure, but it would take me some time to work out how to do it. I tried getting both tables and records expanding in one function, but I kept getting type errors. @Mike I was wondering if you manage to fix the issue. I am looking at one of the xml data that have both value and table in the column that fails when used the with ExpanAll Function. @Thakks no I didnt. Perhaps you could call ExpandAllRecords, then ExpandAll ? Fantastic. After an hour of trying to create the same thing I was ready to throw my laptop at the wall – so the fact that you put a template out into the world that does this is very much appreciated. Seriously. Huge amounts of thanks. Thanks for sharing. I think this is a workaround for an issue/bug in PQ, so I created an item in the PBI issue list. Pleas consider to upvote! Thx. I am getting a list of records after making bunch of API calls. Tables expand fine and show their contents. An error occurred in the ‘ExpandAll’ query. Expression.Error: The column ‘Column1’ of the table wasn’t found. Hi Denver, you can’t – the column names are already hard-coded in the M, so you have to edit the M the UI generates. 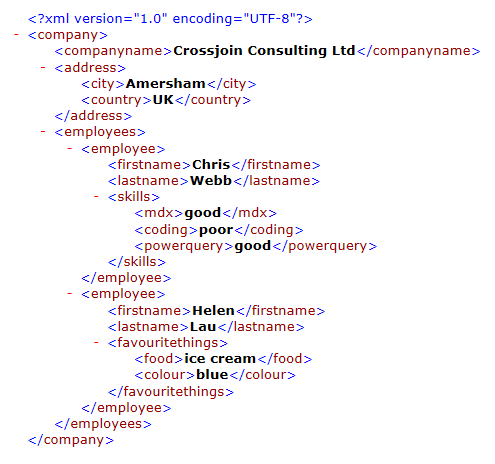 In my XML query I was occasionally getting whole columns which would return as Tables. Deploying this initial function took forever because it had to iterate over entire columns which I knew would be text. Since I knew the whole column would be a table I was able to get a dramatic performance increase by only checking if the first element in the column is a table. Check out the code below and I hope its useful to someone! This worked ! Thanks again ! Is there any guidance for JSON format dynamic extraction of all List and Records ? You’ll be able to do it in M, but I don’t think anyone has blogged about it and it would take me a long time to write the code. i get a cyclic reference warning ¿Any suggestion? Thanks in advance.